Summer is back and training is easy. Last weekend I also took part in 2 races, a Hill climb in Bühlertal and a road race in Merdingen. Both races took place close to Freiburg. In Bühlertal I was awfully bad. A leg problem that I have been fighting with for more than a year reminded me of it existence again. I hardly could pedal anymore and nearly had to stop. The muscle in my right thigh sometimes doesn’t co operate with me and the pedalling is close to impossible. This only happens when I am really pushing myself. I have the feeling that there is not oxygen transportation into the muscle. The reason to this hasn’t been found out yet. Despite of a bad moral I decided to start in Merdingen last Monday. Wonderful weather and a couple of pro teams on the start line. Usually I am a very aggressive rider and attacking all the time, but due to my thigh problem I couldn’t take any initiative, but once. This was in the third lap of seven. The group split up and a leading group with 6 riders continued. I was in there. Luckily the climb was not so long and in the flat parts I could recover and shake my leg. Weird feeling not being able to push hard, something I am usually good in. In the last lap there was another attack and 4 girls were now fighting for the victory. There was only one challenge, how to beat the two Cervelo test team riders. I knew they would start to attack sooner or later. The break away attempts started when 3 kilometres were left. I followed the first attack. The second attempt from the Cervelo riders was a very bad one and the four of us kept together. The third attempt was the most difficult one, because I had to catch the 2 who made the brake away. I just made sure that Sarah Düster would not become any advantage of me, so that she had to work exactly as much as me. I knew she would go for an attack right away. This I had to follow. Exactly that happened and we got a gap. I think a very bad racing from the Cervelo riders. 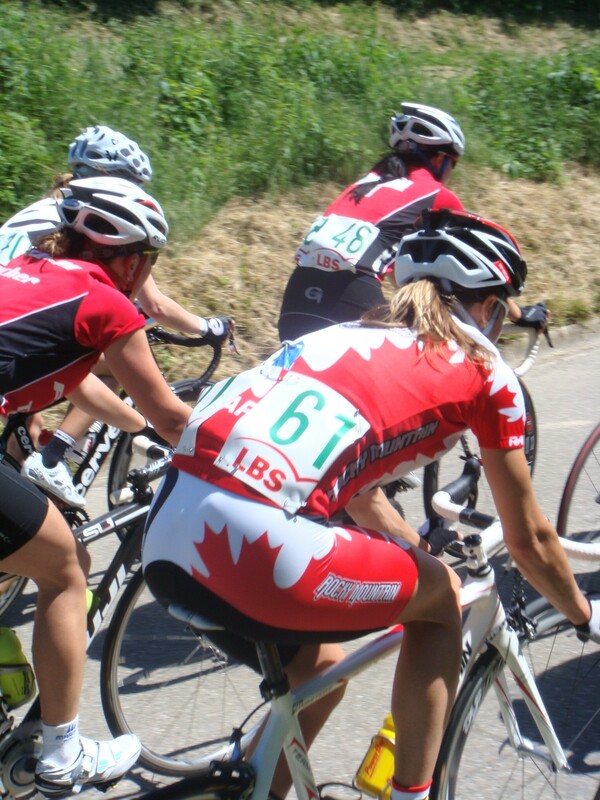 With 2 girls from the same team against 2 other riders you don’t leave it to a sprint. You want to make sure that the team wins. With me in a sprint there is a fifty fifty chance to win. Ok, I am a disastrous sprinter, but anyway. So I finished second and was very happy about the result.